The cast from the Taiwanese film Kano, together with local politicians and officials, pose for a group photo in front of the new Kano feature wall in Chiayi on Thursday last week. Chiayi City Government plans to build a Kano Park next to the Chiayi City Municipal Baseball Stadium and create a “Taiwan Baseball Boulevard” that will run from Chiayi Train Station up to the front of the baseball stadium — the route that the Chiayi Agricultural and Forestry Vocational High School baseball team — abbreviated to Kano in Japanese — took when they made their triumphant homecoming all those years ago. On Thursday last week, a Kano feature wall was unveiled on the corner of Ciming Road and Jhongshan Road as a preliminary taster. Chiayi Mayor Twu Shiing-jer says Chiayi is the hometown of Taiwanese baseball and he wants to give visitors to the Kano Park a feast for the eyes as well as fun things to do. Twu says that, through film director Wei Te-sheng’s movie, Kano has become the strongest component of Chiayi‘s tourism industry, while also strengthening feelings of goodwill between Taiwan and Japan. Building the Kano Park will further enrich the Kano atmosphere in Chiayi, says Twu. Since the movie was released, the Japan National Tourism Organization has organized tour groups to Chiayi every month, specifically so that tourists can see the city that gave birth to the baseball team. 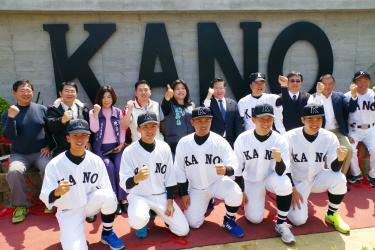 The Kano Park plan includes a 10 meter-tall, 13 meter-wide Kano baseball team entrance sign, a 350 meter-long “Taiwan Baseball Boulevard,” a baseball playground, a space for baseball fans to gather and support their teams and an indoor historical baseball museum that will display trophies and other Kano-related memorabilia. The park will also house a coffee shop and restaurant.